PM Modi is also expected to meet US Vice President Mike Pence on the sidelines of the summits in Singapore on November 14. 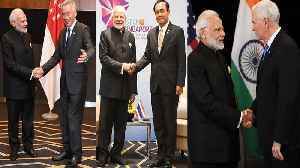 PM Modi meets Global leaders of Singapore, Australia and Thai at the East Asia Summit of Singapore. PM Modi also met US Vice President Mike Pence during this time. There were also discussions on bilateral relations as well as other global issues between the two.